Personalized Softball Pillows with her Name and Jersey Number or Monogram typed into the text box templates. 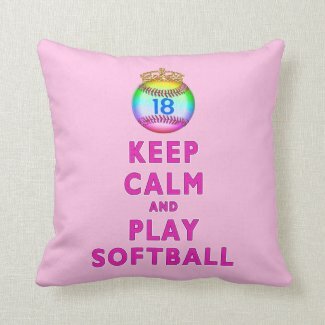 You can even change the text and background COLORS to Your Team Colors or CALL Linda to make Changes for you: 239-949-9090 Our Softball pillows are perfect gifts for Softball Players, Team Coaches or even Moms! Check out more of our cute softball gifts for girls. CLICK HERE Girls Softball Pillow and Gift Ideas! A Swing and a Hit Girls Softball Pillow and Matching Blanket! Terrific Gift Ideas for your Senior Softball Players! Customize with Name, Jersey Number or Year and school name, even. Text size can be adjusted to include two lines of smaller text. 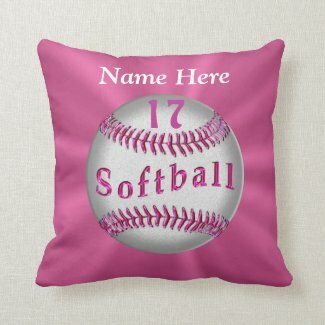 Softball Theme Bedroom Decor ~ A Perfect Accent for your Softball player’s bedroom or dorm room! Personalized softball gifts with her name and jersey number (or monogram). You can CHANGE the COLORS of the background and or text COLORS on most of these softball throw pillows. The regular size Softball pillow is 16″ x 16″ inch, and is made of high quality Simplex Knit fabric, tough but soft. Beautifully printed and wrinkle free. Made in the USA, machine washable, hidden zipper. Home Run! You can also select a large 20 x 20 inch softball pillow, lumber softball pillow and more. Polyester and Cotton Fabrics available on all pillows. Home Run! The game of Softball became an official sport in 1910 and has celebrated over 100 years as a pro sport ~ and according to Covering the Bases, softball is played in over 100 countries! No surprise that over 5.9 million girls and women have taken up the beloved sport and made it their own! Hit a Home Run with Softball Pillows and Matching Blankets! Great gift for Girls Softball Gift! ~ Customizable pillow and matching blanket with your Name, Jersey Number or Year, and endless palette of colors to change the background color. “Always want the ball” ~ Brittany B, pitcher, Colorado. “Softball today, Softball tomorrow, Softball forever” ~ Author Unknown. Thanks again, Covering the Bases! Some Cool Girls U.S. Softball Team Names ~ Maybe yours is listed! What’s yours?! If we don’t have your Team Name here, let us know, and we’ll put it in our list of Cool Girl’s Softball Team Names! Thanks to MaxPreps America’s Source for High School Sports for this compilation of Girls Softball Team names in the U.S.
For the Love of Softball Pillow! 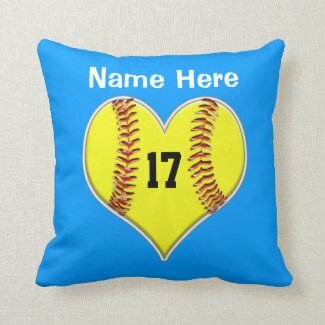 Custom Softball Gifts ~ With your name and jersey number or year or other choice of text, show your love for Girls Softball! You can even change the background color if you choose. 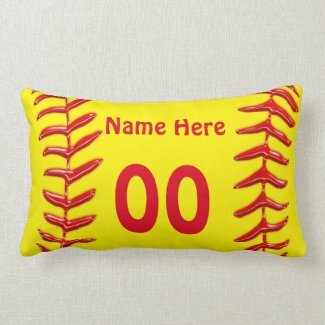 Really cool Softball Pillow with name, number, team name or colors. Machine Washable, hidden zipper, soft fabric, excellent printing, for a terrific keepsake! Sweet Softball ~ Cheery Pink or change the color if you would like! Your name or text, number, or team name above the word “Softball.” You choose your text in the text boxes! Very cool shiny softball threads add a great dimension to this softball pillow! Did you know that softball’s first bat was actually a broom handle? Or that Softball was also known as Diamond Ball and Mush Ball before it earned its name as we now know it? 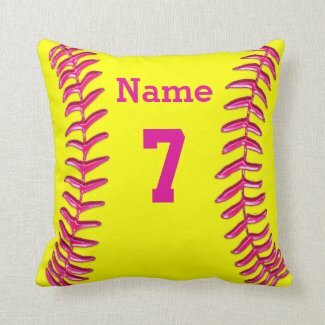 Softball Decorations for Bedroom ~ Shiny threads accent this neat Softball pillow with your Name and Jersey Number! Text box on the back for Jersey number or Year or name can be printed. Background color can be changed! Click on the above pillow and see how the back side will look! Relax after the 7th inning with this great softball pillow! More Fun Facts about Softball A boxing glove rolled up was the original softball! It evolved into a 16-inch ball that was soft enough that gloves weren’t needed. Since softball originated as an indoor sport, with shorter bases, I’m wondering how many home runs were hit or lights broken! Keepsake Pillow ~ Your Senior Softball player will love this multicolored softball pillow and matching blanket! Customize with your Name and Number or Year, may be two lines of smaller text. The background color may be changed. Click on the pillow or blanket to customize your great memory keepsake she will enjoy for years to come! Lumbar Pillows ~ This is one of our most popular Softball pillow designs, with the beveled threads. The lumbar pillow measures 13″ x 21,” is machine washable, and made in the USA. Wrinkle free, and 100% polyester, made with tough but soft Simplex Knit Fabric, comes in different sizes. Can be personalized with your colors and name, monogram, or text! I Heart Softball Pillow and Matching Blanket! 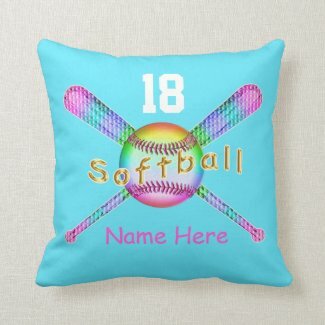 I Heart Softball ~ With your name and number, and add the matching blanket to this Softball pillow and you have a winning team! Background colors may be changed. Great decor for a bedroom or dorm room! Before a Double-Header Softball Pillow! Before a Double-Header Softball Game ~ Cool out! ~ 16″ x 16″ accent Softball pillow, great for living room or bedroom, showing your love for the game and your team spirit! You can change the number to reflect a year or a jersey number. The background color can be changed! This multi-colored softball is a very popular item. Did you know that the American Softball Association (ASA) is the National Governing Body of Softball, named by the United States Olympics Committee? ASA is the strongest nonprofit organization in the USA and was founded in 1933, forming soon after softball became an official sport. That’s a lot of history and a lot of influence in the sport! Some of its duties are to insure fairness in competition and equal opportunity. The ASA crafted unified rules of play when there was confusion as the sport was being played in different areas. The ASA is one of the fastest growing sports organizations and has grown from a few hundred teams to over 200,000, representing every state, with more than four million members! That’s an easy home run! ASA/USA effectiveness for promoting softball is accomplished by offering skill and age leagues so everyone can compete at their level. ASA holds over 100 National Championships! ASA/USA has created the National Team Program that sponsors youth clinics, National Coaching Schools and training camps for youth coaches and athletes. They’ve established the ACE Coaching Certificate Program, certifying coaches of all levels. ACE stands for Achieve, Certify, Educate. Very cool! And to ensure safety, background checks of coaches and personnel are conducted yearly. ASA/USA also has an Equipment Testing and Certification committee that keeps a watch on rules and specifications regarding equipment. The ASA also registers over 38,000 certified umpires and is the only softball association to offer training and UIC (Umpire-in-Chief) clinics to maintain and promote a positive experience on the field for coaches and athletes. Go Umps! Did you know there is the ASA Hall of Fame Stadium in Oklahoma City? It has hosted more NCAA Women’s College World Series than any other site. ASA/USA partners with Liberty Mutual Insurance Responsible Sports Program, providing expert advice for coaches and parents, striving to better youth sports. ASA/USA Softball gives assistance and partners with Special Olympics Softball every year. ASA donates time and resources continually, as well as umpires volunteer their time and talent. If you would like to find out how you can show your support for this great nonprofit organization, you can contact them here ASA/USA Softball. Dream Big, Dream Often, and Whoop! Visit Amanda Scarborough’s blog for inspiration, motivation, and education, and anything else to do with Girls Softball! Whoop Whoop! If you need help with any customizing, at no extra charge, call Bev for assistance, at 239-949-9090. Fair or Foul? Check out this commentary about umpires calling balls “Fair or Foul?”, plus a wealth of information on playing the game, and how to call certain plays, on the Website Girls Softball. See you there!